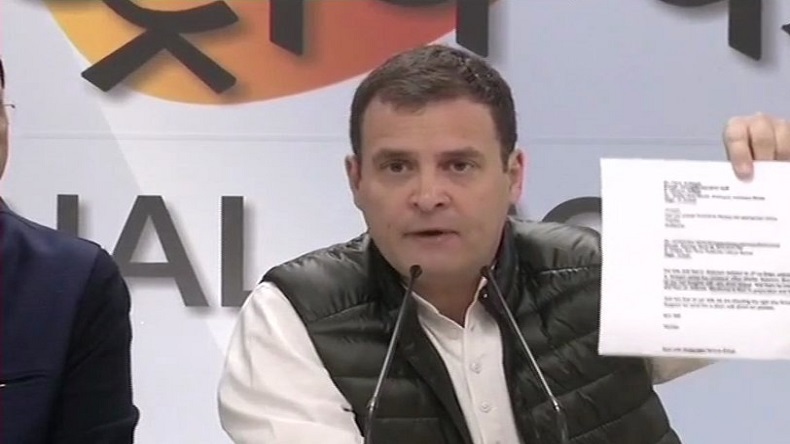 Rafale deal: Rahul Gandhi asked why Narendra Modi was maintaining silence on the latest revelations in the Rafale deal and said the Prime Minister has to answer how did Anil Ambani know 10 days prior to the Rafale deal announcement that he will get offset contract. Rahul Gandhi asked why Narendra Modi was maintaining silence on the latest revelations in the Rafale deal. Hours after a media report claimed Anil Ambani met French Defence officials two weeks before the Rafale deal announcement, Congress president Rahul Gandhi accused Prime Minister Narendra Modi of working at the behest of his businessman ‘friend’ Anil Ambani. Addressing a press conference at the party headquarters in New Delhi, the Congress chief presented a letter before media persons claiming that an Airbus executive wrote that Anil Ambani met the French Defence Minister and told him 10 days before the Rafale deal was signed that he was going to get it. Rahul Gandhi asked why Narendra Modi was maintaining silence on the latest revelations in the Rafale deal and said the Prime Minister has to answer how did Anil Ambani know 10 days prior to the Rafale deal announcement that he will get offset contract. Then Defence Minister Manohar Parrikar, Hindustan Aeronautics Limited, Foreign Secretary were not aware of this, but businessman Anil Ambani was, he questioned, adding that criminal action must be initiated against PM Modi for violating Official Secrets Act if these reports are true. The Congress scion said Narendra Modi did what a spy do and alleged that he informed someday about a defence matter. The prime minister had taken the oath of the Constitution to protect these secrets, he further said. The Supreme Court judgement in the Rafale deal was under question now as the Modi government did not submit this information revealed in various media reports to the apex court. CAG report is a worthless report, the Congress president said terming it ‘Chowkidar Auditor General Report’.